Relámpago del Cielo Inc. (RDC) , a 501(c)3 non-profit organization is celebrating it’s 30th Anniversary. Enthralled by the music and movement learned in classes taught by Ms. Rosie Peña at Santa Ana College, a handful of her students resolved to join forces in expanding their newly discovered appreciation of the folklore of Mexico. Encouraged and guided by their enthusiastic instructor, their vision soon gained momentum with the recruitment of other equally-minded individuals. 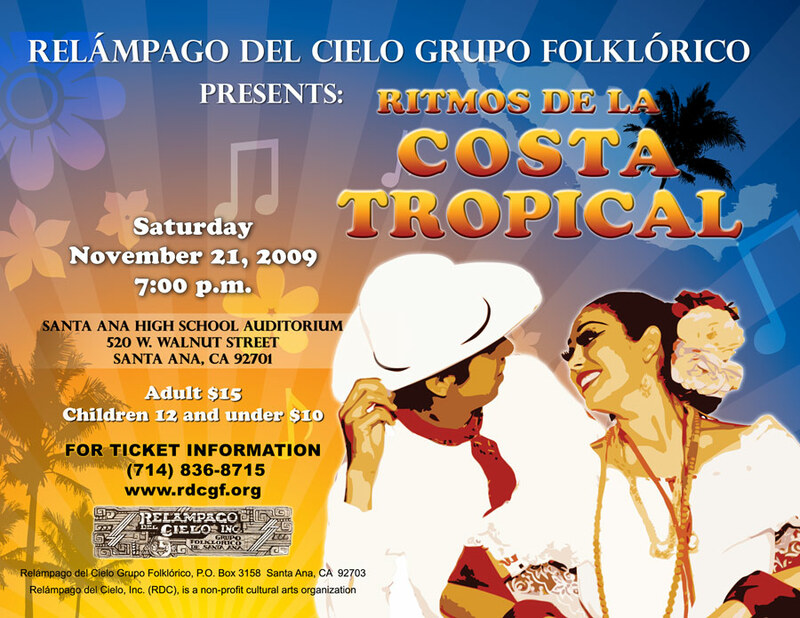 This dream culminated in the formation, in 1975, of Relámpago del Cielo Grupo Folklórico. The “Grupo”, not satisfied in simply learning the prescribed steps to the dances, felt the cultural inclination to learning the why and wherefore of this musical heritage. This need was met by the founding of Relámpago del Cielo, Inc. Through the advent of this cultural and artistic organization, an umbrella opened to accommodate the study of the history, geography and customs as well as the music of the varied regions of Mexico. To date, the organization has not wavered from its original goal and bears the privilege of being the oldest operating non-profit institution of its kind within the region. RDC takes pride in having been instrumental in the development of several dancers who have worked professionally both here and in other countries. Relámpago has also been instrumental in training various teachers who have now returned to their local communities to share their acquired knowledge and to occasionally form groups of their own. The “Grupo” is proud that some of its original members have returned to fill various positions within the organization and that there are some second and third generation dancers who are equally committed to foster the dream. The desire to enrich their own as well as their audiences’ pride and cultural awareness has earned Relámpago del Cielo Grupo Folklórico the recognition and respect of colleagues in the United States and México. Over the past thirty years, RDC has touched thousands of people through various programs. The artists-in-school program traveled to various schools throughout the county to educate students and teachers about Mexican culture by exposing them to different regional music, folklore and art. Teacher workshops further expanded our efforts to educate the community. In addition to this community outreach service, RDC has consistently offered folklórico classes at little or no cost to its members. Our students regularly perform for community organizations and cultural events throughout Orange County. « Wassail with the O.C. Human Relations Commission on Dec. 10, in Santa Ana!